We saw magic happen last night on broadcast TV that is supposedly dead. CBS 60 minutes had the scoop of getting Amazon CEO Mr. Jeff Bezos reveal the future of package deliveries. Actually I should refine my statement, we did not see magic happen we saw an expert magician at work, Mr. Bezos that is, not Mr. Charlie Rose. And we all went along with the magician. Clearly Mr. Rose, the reporter whose job is to show disbelief, did not bother to even feign one. He was happy as a child in a magic show. Strike that, have you seen how children these days treat magicians you invite for birthdays? They don’t sit in their allocated chairs and simply applaud in awe. They nag, they jump from their seats, they want to see what is in the other hand, what is the color of the back of the rabbit. Because children do not suspend their disbelief or curiosity. Why are you telling me this when you just refused to deny or confirm your set-top box roadmap? Why are you not using this already inside your million square feet warehouses so you do not need people walking miles to pick up products from shelves? Why is it relevant to a customer how you deliver the package as long as they get it on time? But reporters these days are afraid of getting access cut. Happy they have the audience. Anxious to become what Mr. Walt Mossberg was to Mr. Steve Jobs to the next Jobs. So they suspend their disbelief and curiosity and let the magicians perform. 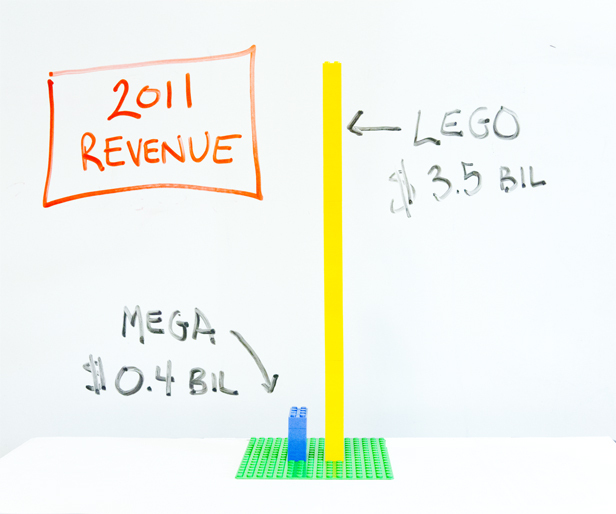 What you see are the annual revenue numbers for MegaBloks and Lego. Since Lego does not have (any more) exclusive rights to make the bricks, anyone can make them. And MegaBloks does. Its bricks are perfect replacement (as for as I know) for Lego bricks only cheaper. Operating Margin 30.1% Lego to 17.6% Mega. A little bit of math will convince you Lego has no cost advantage. At 30% cost, even if it halved its price to match Mega’s prices, its margin will be 40%. In other words any (percentage) margin advantage Lego has comes purely from its pricing and not because of cost advantage. What is going on here? In the words of Jeff Bezos, isn’t MegaBloks working hard to charge customers less and Lego working hard to charge more? Why aren’t customers overwhelmingly picking MegaBloks based purely on price? If lower prices are designed to drive market share how come Mega has just 10% of market share despite being priced at 50% of Lego? The Planet Money story says it is because of Lego’s attention to detail and because of their licensing deals for Starwars. But they miss the point. The answer, as in all pricing questions, begins with customers. Think about the loyal customers who already have spent hundreds if not thousands building their Lego bricks collection and bought into the Lego brand and its messaging. Include the newbies who are getting inducted. Toss in those who are buying Lego as gift for someone else. Do you think any of these customers would make buying decisions based on price? What job do you think these customers are buying Lego for? I bet it is just not as a building blocks toy. If such customers perceive value at its current prices and are willing to pay such prices there is no reason whatsoever for Lego to give its product away at lower prices. Pricing low because of cost, competition or in the hope of gaining market share is simply not effective pricing. Lego’s effective pricing driven by customer segments helps it achieve 70% gross margin and 90% of the market. Finally I should not dismiss MegaBloks or call its pricing bad. MegaBloks likely knows its target customers as well -a tiny fraction that is price sensitive but isn’t likely to grow. They likely found the optimal segment size and the price these customers are willing to pay that will help Mega deliver 17.6% operating margin (nothing to be sneezed at). But if it really wants to put big numbers on the board it needs to get its own customers who are will hire it for its compelling value proposition and not because it is a cheaper substitute.